Capacity Development (CapDev) has been an integral part of the World Agroforestry Centre’s (ICRAF) overall program to both facilitate the use and impact of its research as well as to enhance the relevance of its research and development for partners’ needs. Capacitating is one of four value propositions ICRAF offers to its clients in its new strategy to achieve the System Level Outcomes (SLO) of the Consultative Group on International Agricultural Research (CGIAR). ICRAF’s global Capacity Development Unit (CDU) at headquarters in Nairobi supports ICRAF staff to develop such capacities within its four Priority Themes in each of ICRAF’s six regional offices through Capacity Development Focal Persons. 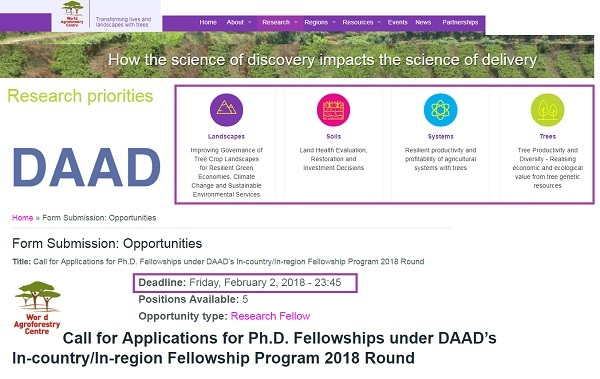 The German Academic Exchange Service (DAAD), through its in-country/in-region fellowship initiative, is considering to fund Ph.D. Fellows who will conduct their Ph.D. studies in various aspects of agroforestry with ICRAF at its ongoing projects in East African offices (Ethiopia, Kenya, Rwanda, Uganda, Tanzania). More information about DAAD in-country/in-region scholarships. The fellowships comprise a stipendium at DAAD approved rates varying for national/international scholars, medical and accidental insurances, hosting costs at ICRAF, university registration and tuition fee according to DAAD rates, and research costs (for pertinent details, see the attached document (Information Sheet for Scholars, 2018/2019). The scholars will need to register at one of ICRAF’s partner universities at the location of the project and commit to complete their Ph.D. degree within 3 years from the date of start of the fellowship. Staff Members of Academic and/or Research Institutions are encouraged to apply but will be required to produce a letter of release / approved study leave from their respective institutions. Eligible female candidates, candidates from less privileged regions or groups as well as candidates with disabilities meeting required qualifications and conditions will receive preference. Earliest: Sept 2018 – August 2021 (initially the fellowship will be awarded for one year which can be extended annually depending on the performance). The dates may vary depending upon the contractual arrangements between ICRAF and the student, or with the academic institutions where candidates are registered. Interested candidates should apply electronically by email to i.ingumba@cgiar.org by 2nd February, 2018 (23:59 Nairobi time).